Craig Baldwin has roped me in. On a wall just inside the building formerly known as CELLspace, an artwork delivers a defiant message: “NOT for Sale!” But the message is a lie — the building, whose exterior walls once featured some of the best street art in San Francisco, was sold and is slated for development. Last summer, two volunteers — artist Russell Howze and art editor Annice Jacoby — took down much of the outside art and put it in storage for temporary safekeeping. What’s left on the walls are stickers, tagging, and remnants of art — including faces of Native American men, a monkey with a sign imagining a battle between two well-known street artists (“Hektad vs. Banksy”), and an impressive work by muralist Joel Bergner. Even in its current state, 2050 Bryant’s art potpourri inspires passers-by to take photographs for posterity. But what about the art that was taken down? Howze, whose own CELLspace work is among the preserved art, and Jacoby are trying to find a patron who will buy the works and display them again. The art includes Bergner’s De Frontera a Frontera, a lyrical, red-splashed work about haves and have-nots in the Dominican Republic, and Icy and Sot’s collaboration with Regan “Ha Ha” Tamanui, Super Hero with Portraits, which has a caped boy standing alongside a gallery of orange-tinged smiling faces. CELLspace moved from its warehouse on Bryant Street in 2012 leaving behind a mural like no other in the Mission: a large metal structure that spans elegantly across the building’s front windows. It now needs to find a new owner. Some half-dozen local artists carefully planned and built the copper and steel mural in 2008. “There was an old façade here, and we wanted it to be different and nicer –unified,” said Jane Verma, one of the artists who added the spiky steel, grass-like element to the mural that was built in the warehouse space. “There used to be ugly and unwelcoming screens here,” said Russell Howze, an artist and CELLspace volunteer for many years who organized the first art show meant to be displayed with the mural. 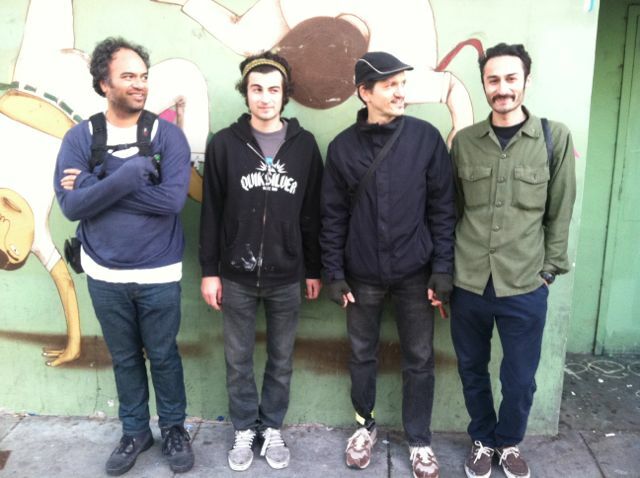 When the volunteer-run art collective CELLspace left the building almost three years ago, Inner Mission took up its legacy, but it is now being pushed out by the new development coming to the block bordered by Bryant and Florida between 18th and 19th Streets. With the inevitable new development, the metal mural will have to be relocated by May. Howze, the author of Stencil Nation, has been rescuing the murals left behind in Cellspace that were still in good shape. With the help of Annice Jacoby, the editor of Street Art San Francisco: Mission Muralismo, he has managed to find buyers for some of them. 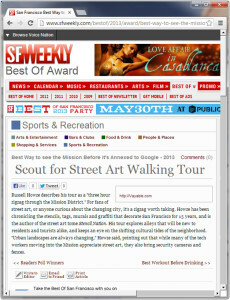 As for the metal mural, Verma is firm about wanting to “keep it in San Francisco. We’d like it to continue to be seen by the public, not on someone’s yard,” she said. “The developer is interested in art,” Verma said, but the mural might not relate to use project. It’s not just one big piece of metal, but eight intricate panels. Aharon Bourland designed a bold graffiti pattern in red copper that runs throughout the panels. The copper patina gives the rusty mural a rainbow-like effect. Tony Verma and Hikari Yoshihara worked on the dripping circles and stones that appear to build in size. The fabrication of the mural took about a year, during which time Tom Phillips and Corey Best, CELLspace volunteers, helped. Each one of the eight panels is 10 feet tall and about 3 to 4 feet wide. The central panel designed for the main entrance, which still holds the words CELLspace, is wider. There is also a narrower panel designed for a side door. Removable plywood planters were added on each of the panels. “I’m impressed the mural stayed for as long as it did,” said Verma. The only missing part in the mural so far is the L in CELLspace. Howze said the idea of breaking the mural into pieces and handing them out as mementos was discussed among volunteers, but Verma and Howze prefer to keep it one piece. Unique to this mural’s structure is the space designed underneath each main panel –a space designed to be a street art gallery. “It was meant to have artwork underneath,” said Howze, who launched the first art show with the opening of the metal mural in March 2008. “We had an opening with an art show, Stencilada,” he said. Today, stencils can still be seen throughout the metal mural. Next door, panels of murals have been taken down and put in storage because tagging took over the artwork on the warehouse walls, said Howze. For the past year, I have been scaling back my online presence. This includes deleting email addresses, unsubscribing to lists, ending social site profiles, and now – taking down StencilNation.org. 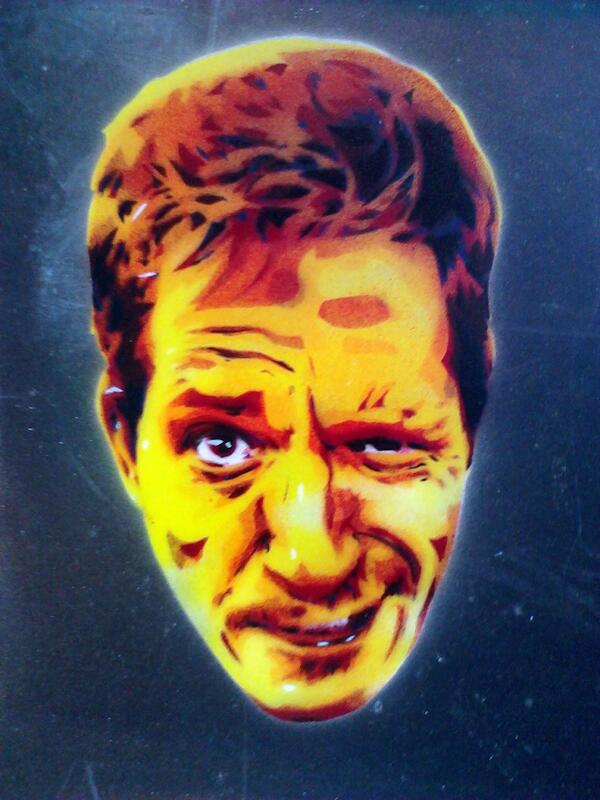 Since the site went live in 2008 after the Manic D Press book was released, it stood as the site least updated (Stencil Archive is always first). Antonio Gomez did an awesome job with the Flash animation, which was standard back then. Now the standard is anything that works on an iPhone or iPad (HTML5, CSS, Java), which is NOT Flash. I never had a static version of the site that mobile devices could default to, and I didn’t want to update the site here in 2014. I still see Flash sites but they don’t work on phones, which is what everyone uses now. The book is now out of print [Nope. Fourth print still in print and available]. It had four successful printings and Manic D’s Jen Joseph always has good things to say about the book. I haven’t sold a copy via the site in months. I may have sold ONE copy last year when I sent someone to the site. I still have copies left for sale! 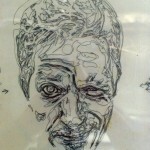 The address stencilnation.org now redirects to the mothership Stencil Archive. You can still buy a book via PayPal on the Stencil Archive site. You can also buy a copy via this site. At some point I may put the Flash site back up on this site for archival fun, much like I do for the 2004 version of happyfeettravels.org. For now, I am keeping it simple. One less site to pay for, worry about, and update. 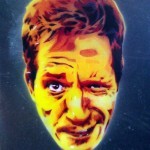 I’m in the process of saying farewell to StencilNation.org. The book is officially out of print (Manic D Press has corrected me, stating that the fourth printing is still in print) and the website was designed (by Antonio Gomez) in the heady days when Adobe Flash was du jour. With the rise of mobile phones and HTML5 (and the whole responsive site mania), it is time to retire the Stencil Nation site and redirect to Stencil Archive (the mothership). While backing up Stencil Nation one last time, I saw a random mp3 file on the top level of the site’s backend. I clicked listen and it was a Cross Currents interview I did while on the book tour. It was a great experience and it actually riled up a listener who felt that all public art was vandalism. Fun! I guess I was worried about taking up too much memory back then. Good thing the cloud revolution caught up and now memory is practically infinite. The interview mp3 is on this site’s cloud, and WordPress even allows super easy linking via its “Add Media” button. Had a great bike ride over to the KALW studio near McClearen Park this morning and interviewed with Penny Nelson for Cross Currents. The engineer, a bike commuter, told me another route that sent me through the park and then down Mission St. in the Excelsior District. Found some stencils along that ride home! They posted the show early so here’s the goods. Fast forward in about 3 and a half minutes to hear my segment. About 10 minutes long total. Had a great time for a few hours with this journalist and her crew. I chose CELLspace to give a tour and film the shots. Good to see some final clips of murals that have already been taken down before the wrecking ball takes the rest. On and off camera, I spoke of my reservations with the share economy. Called it a euphemism as well as a warning about how one sees work and the ways that the share economy’s work ethic leaks into personal and private time. I also spoke on how AirBNB does NOT pay into the Hotel Tax Fund, which funds the arts here in San Francisco. Watching this piece, with almost no French comprehension, feels fluffy. Maybe the butterfly and flower animations gave it away. Those are still beautiful shots of the art at CELLspace. And the journalist and crew were very nice, lefty Europeans. 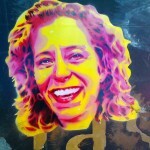 HappyFeet’s sister site, Stencil Archive, continues to thrive amongst the street art webstreams. HappyFeet began in 2002 when my stencil photograph selection grew to a point where I felt the need to scan and upload to share and share alike. Last week, Stencil Archive saw the 20,000th uploaded photo, which has been dwarfed in size by corporate sites like Flickr. Back in 2002, a simple Google search brought up maybe 6 sites, none of which were covering the growing, pre-Banksy scene. Stencil Archive met the need and many sites soon followed. Now they are all vaguely “street art” sites. Stencil Archive is still 100% all about stencils! Russell Howze describes his tour as a “three hour zigzag through the Mission District.” For fans of street art, or anyone curious about the changing city, it’s a zigzag worth taking. Howze has been chronicling the stencils, tags, murals and graffiti that decorate San Francisco for 15 years, and is the author of the street art tome Stencil Nation. 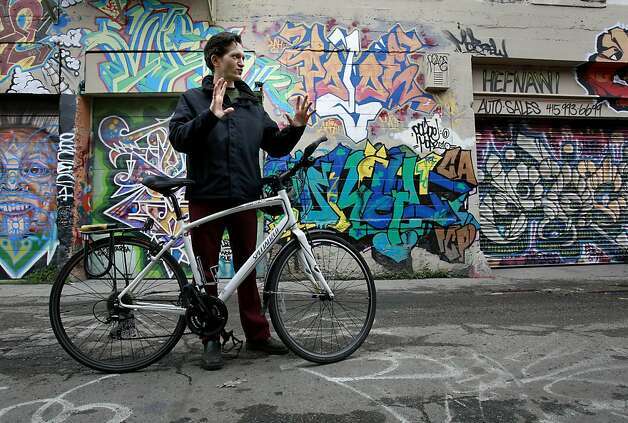 His tour explores alleys that will be new to residents and tourists alike, and keeps an eye on the shifting cultural tides of the neighborhood. 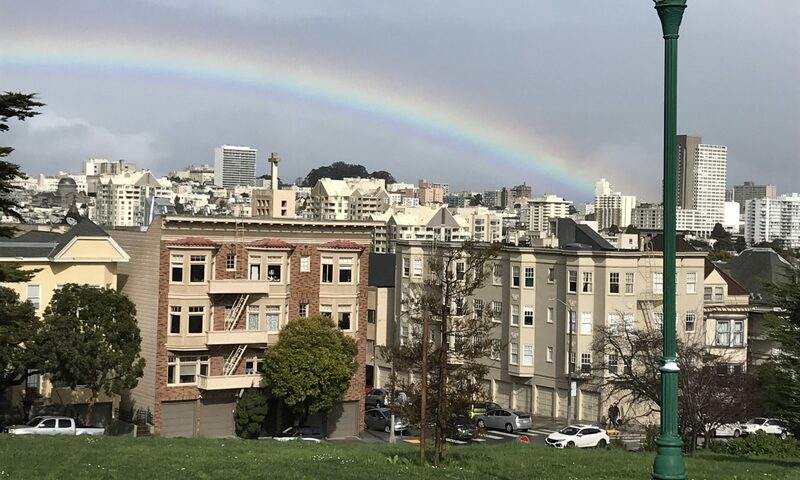 “Urban landscapes are always changing,” Howze said, pointing out that while many of the tech workers moving into the Mission appreciate street art, they also bring security cameras and fences. 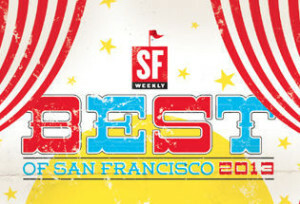 2013 SF Weekly Best Of Winner…. In the Facebook worlds, posting all this stuff is instant, and friends find things and post them. 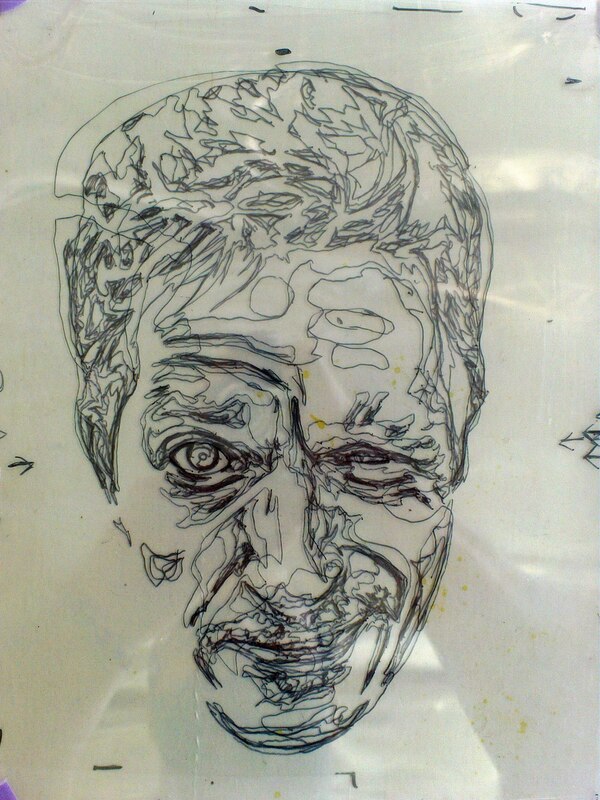 I take the trouble to pull things off of there for the Stencil Archive, my own archives, etc. and then maybe, just maybe, post it on here. I forget that some friends don’t do Facebook! And I have to remind myself that this blog belongs to me, as opposed to a multi-billion dollar corporation that is currently dot com booming the Bay Area. 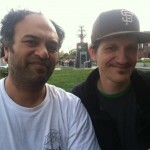 This site is also a great, long archive of my life here in San Francisco. So back in late January, Regan Ha-Ha Tamanui stopped over on his way back to New Zealand and Australia. He’d been traveling the world for a year, but got stuck in Berlin for eight months. How unlucky. I got him four walls here in SF, and he took my photo after a day of wandering around the Tenderloin looking at street art. 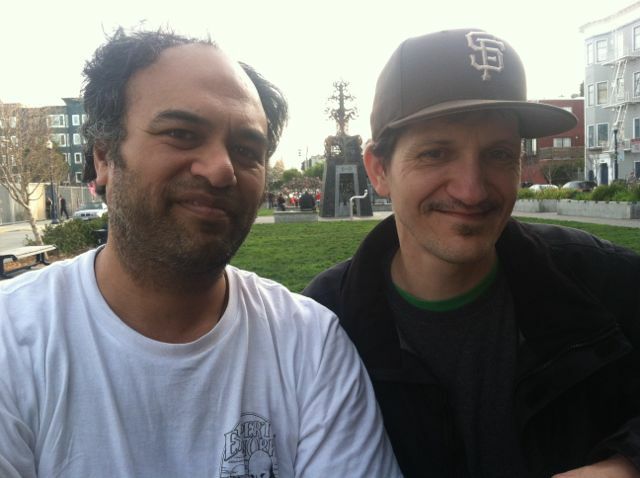 He cut a stencil portrait out of that photo, as well as the photo he took of my friend Monica that evening in Hayes Valley. Icy and Sot, expats from Iran who now live in Brooklyn (leave Iran to have a street art show, go back to Iran and get arrested for satanism) were driving through. They all took my tour and I got them two walls to paint on. Regan collaborated with them. Icy and Sot came back to SF for an art show at a Noise Pop concert. I missed it (always seem to miss the good art shows!). 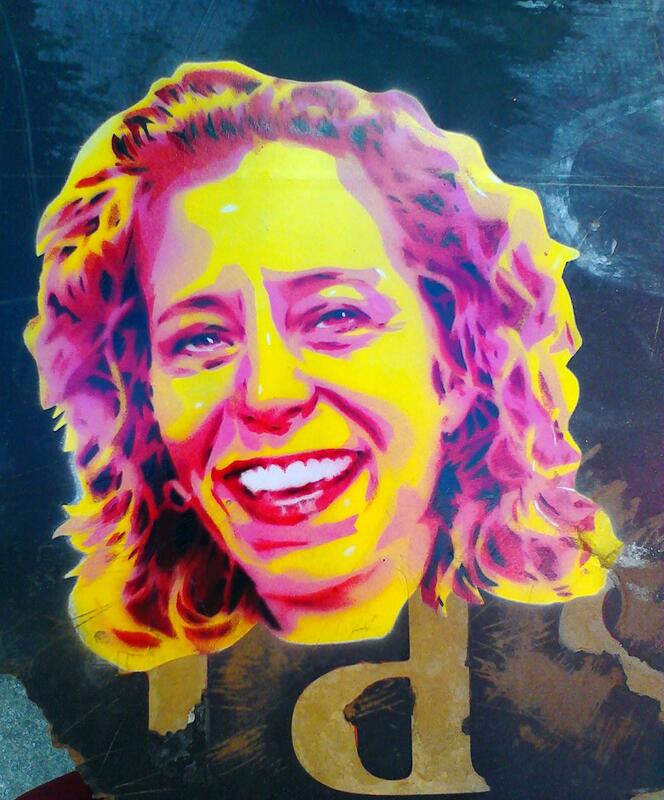 Here are photos from early Feb, with the stencil portraits thrown in. Muralists around San Francisco say that they’ve seen an increase in vandalism of murals by taggers, who are defacing the art with their monikers. Vandals have wrecked murals from North Beach to the Tenderloin. In the city’s liveliest mural zone, the Mission District, muralists say it’s been particularly bad. Street paintings made in months have been ravaged in seconds. 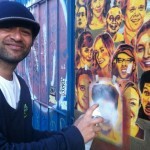 Vandals this year have defaced parts of the Mission District’s Clarion Alley, a 20-year-old street museum of murals. “Gold Mountain,” a North Beach mural depicting Chinese history, had to be repainted when the building owners couldn’t keep it free of graffiti. Street Art – The Fun Loving Criminals? For many decades, street artists have made San Francisco’s Mission District one of the most colourful and fascinating places to see , mirroring the city’s vibrant multiculturalism and diversity. We are walking through some of the stinkiest alleys in San Francisco, yet still tourists from all over the world come here to take pictures and admire the street art gallery surrounding them. Whether huge murals, stickers on the floor or graffiti: art is all around in this area of the city. 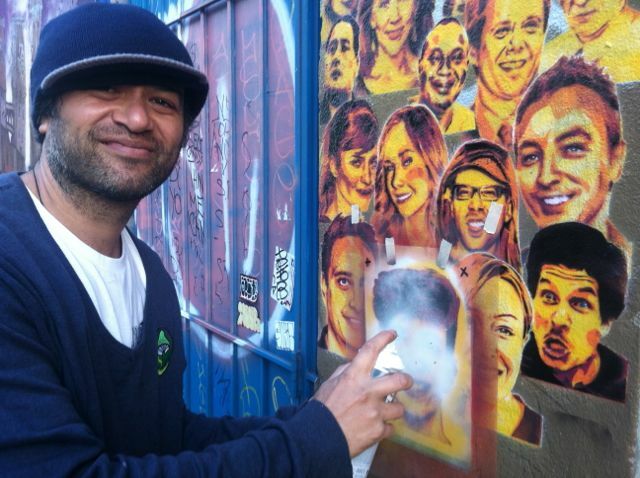 Our tour guide Russell Howze, who offers street art tours through the Mission District, has been walking through these alleys for 15 years, and still he discovers new pieces. “Once you train your eyes, it’s everywhere” is what he tells us as he points at a street light covered with almost torn off stickers and scribbled words, which would normally never catch someone’s eyes as art. Walking through Mission and Valencia Street we come across walls with both illegal and legal graffiti, stencils and other street art styles. Comics as well as posters and abstract pieces look down on us from the left as we try to read a graffiti on the right. Unlike in European metropolises, in San Francisco trains are no major hotspots for graffiti. The sprayers here prefer trucks instead and almost every truck we pass during the tour wears at least a small graffiti tag. 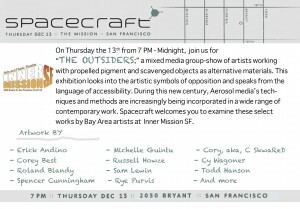 Spacecraft presents “The Outsiders,” a mixed media group-show of artists working with propelled pigment and scavenged objects as alternative materials. This exhibition looks into the artistic symbols of opposition and speaks from the language of accessibility. During this new century, Aerosol media’s techniques and methods are increasingly being incorporated in a wide range of contemporary work. Spacecraft welcomes you to examine these select works by Bay Area artists. We hope to explore this dialogue further. 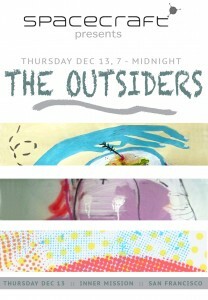 Until then, please join us on Thursday, December 13th at 7 p.m. for Spacecraft’s “The Outsiders” at Inner Mission [formally CELLspace].